The difficulty of writing exactly what we mean and conveying it in a way that is clearly understood by the reader requires painstaking effort and many revisions. Human communication is broken, shot through with our human frailty and sin. Therefore, this is a lifelong challenge, one we must continually strive to address as writers. One of the benefits of the written word is the power to edit. When we speak, our words often blurt out, surprising ourselves and others. We’re unclear or require many words to say what we’re attempting to communicate. This is why we write out and then practice pitches and presentations. The ability to edit usually allows us to get it right before we publish or pitch. However, even then, writers need to retract. We think we communicated well, but we didn’t. We assume we conveyed a particular truth, but the reader received another, thinking we were making an entirely different point. We publish a blog post only to read the finished piece online and discover a glaring error glossed over and unseen as we edited. We knew what we meant to say, so we became blind to what we’d actually written. This is a habitual problem, one requiring us to be alert as we edit. Did we really write what we meant, or do we only think we did? As a writer who has firsthand experience with these types of glitches, an undergirding truth always encourages me: I have a perfectly attuned, supernatural Collaborator. Even when I can’t articulate what I mean, the Lord understands exactly what I feel and hope to communicate. He knows my heart and my mind, even before I think my thoughts or formulate them in writing. He perceives the truth I’m attempting to get across to the reader, and, thank God, he longs to help me to write it correctly! 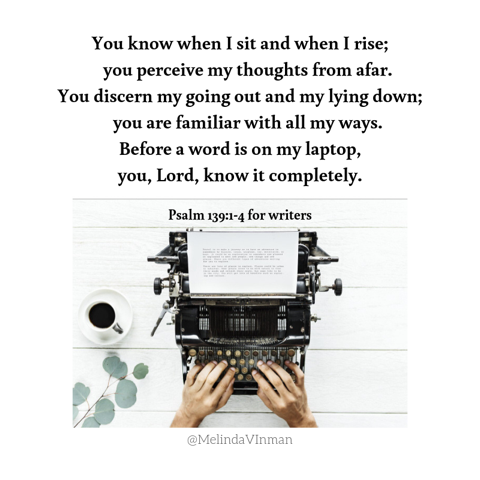 As writers, we could rephrase: “Before words flow from my mind and through my fingertips, you, Lord, know my thoughts and what I hope to convey, even if I don’t.” Because the Lord knows what I hope to say and what he desires me to proclaim, I can cry out to him for help. Our mighty God empowers us to write what we mean. This is an essential fact for Christian writers to keep in mind. We have a Helper. The Holy Spirit’s help in conveying the message, all while using our faculties, gifts, and yielded selves, is the powerhouse for our writing. He gives us the courage and the ability to hammer out words that advance the kingdom of God. We can cry out to God for clarity. We can pause, ask him to help us to write what he wants for our audience, sit silently before him, and then write to the best of our abilities with his help. The words come to us. Our thoughts are clarified. This is what he does. We don’t write alone. We write with God’s help. Hold onto that fact. Lean on it. Trust it. Allow the Lord to empower your work, your words, and your ability to convey the emotion of your message. He’s your most important collaborator. Acknowledge him in your preparation, in your writing, and in your editing. Trust him. Rely on his insight. Let the Word empower your words, touching hearts for his glory. He’ll make the way straight. Raised on the Oklahoma plains in a storytelling family, Melinda Viergever Inman now spins tales from her writer’s cave in the Midwest. Her faith-filled fiction illustrates our human story, wrestling with our brokenness and the storms that wreak havoc in our lives. Find her weekly at http://MelindaInman.com/blog/. 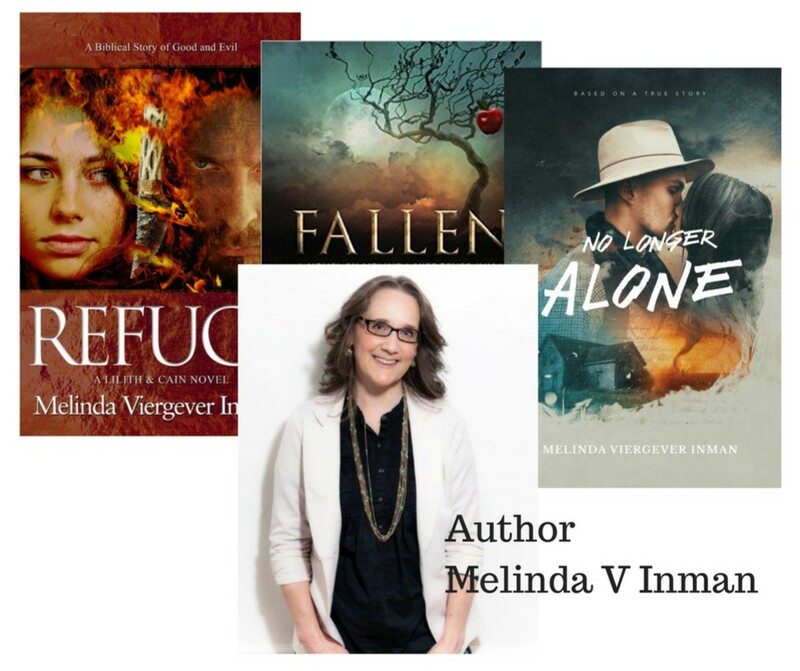 To find her work and to be notified of future published novels, follow her at http://bit.ly/MelindasBooks/. Wonderful words of encouragement! Thank you! We write with God's help. Lean on it. Trust it. Love that. It will be my mantra as I muddle through to find the best ending for what I'm working on today. I'm so glad it was timely, Alice! These are the truths we must remember. I always need to remind myself or I forge off on my own and get stuck. He's our Helper, and he wants us to lean on him! So essential, Melissa! Writing what we mean isn't always easy! This is so encouraging, Melinda. I have published words that don't really convey what I wanted to say. I spend days editing my blog posts, mulling them over, reading each sentence, each word. In fact, I'm rewriting a couple posts right now because the flavor of them is even a little off to me, the writer! I May even point readers to your post (this post) in my rewrite if you don't mind. Thank you for this. God surely does help us. I've seen that over and over. I don't mind at all, Stephen. Please do share. The editing and revising for most of us involve exactly what you describe. We often don't come across to the reader in our authentic voice or we write something that isn't quite what we meant, but it isn't readily apparent until we sit and ponder what we've written. Writing requires thought, prayer, and editing. I often have to ask the Lord to help me to say what I mean in the way he knows is best. Love, love, love this, Melinda! I do ask for the leading of the Holy Spirit with everything I attempt to communicate through writing. You capture all of the pitfalls so well here! As part of this process, I have also learned to thank the Lord when I find the errors. For one, because it keeps me humble. And that is right where God wants me to be. Secondly, it helps me extend more grace when I catch a typo on someone else's work. Finally, it keeps me more dependent upon His hand doing the work, that ultimately only He can do. Holy Spirit, write through us we pray! Every word, every space, every syllable! May it all be Yours. All great reasons to be grateful for the Lord's work as he shows us our errors! It's always good for us to discover our personal flaws and weaknesses and to see our mistakes. The more we see our own humanity and our need for Christ, the more we do extend grace to others. Humility is essential in our Christian lives. We truly do rely on the Lord. None of this is of or by ourselves. You have such a kind heart, Melissa. Thank you for sharing your thoughts. A-Men Sister thank you so much for the reminder and encouragement!! Thanks for stopping by, Stephen. God bless! Wow, I love this, Melinda. You so cleverly paraphrased those verses of Psalm 139 for writers. Such a powerful thought how the Lord is our most important collaborator. He is! And our helper the Holy Spirit assists in conveying our message. We miss this vital truth when we try to do it on our own, never ask the Lord to partner with us or the Holy Spirit to speak through our words. "Lord, help us write with clarity of mind and thought, inspire our writing as we look to you for empowerment, and grant us wisdom and focus. Amen." Amen, sister! I pray that prayer along with you. It's easy to slip into self reliance, to write leaning upon our own skills and thoughts. I'm so grateful that when I do that, the Lord allows me to run into roadblocks where I must cry out to him for assistance. He keeps me close, and I thank him for his love and grace! I needed this reminder and encouragement tonight. Not only can I look to God for what to write, but I can ask His help for how to write it. Thank you Melinda! Jennifer, I'm glad this message was timely for you! Look to the Lord and ask for his help! We all need this! God bless you, sister!